Welcome to the Victory Through Jesus website! circumstances caused us to take a lengthy hiatus. A lot has been happening recently including the publication of Dr.
available through your local bookstore! look around the site but be sure to check back often! Charles Evans' book, TEENS AND DEVIL WORSHIP - WHAT EVERYONE SHOULD KNOW, has been read around the world. The book has been featured on The Montel Williams Show and is catalogued with The National Criminal Justice Reference System (U.S. Department of Justice) as an information source for occult/satanic referenced criminal activity. The bad news is - the book is no longer in print. 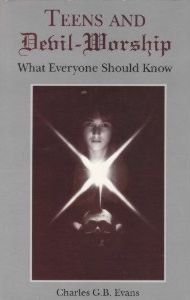 But the good news is - The Second Edition of TEENS AND DEVIL WORSHIP - What Everyone Should Know is now available! Up-dated and expanded, the Second Edition is sure to prove helpful and encouraging to parents, pastors, youth workers, law enforcement personnel and even the teenagers themselves. Click on our BOOK PAGE link to learn more and order a copy from your favorite bookstore today!